Student life and extracurricular activities are an integral part of KazNMU as an educational institution. The university encourages and supports our students to participate in extracurricular activities that have an educational and entertainment value. Smoking and consumption of alcohol is not allowed at KazNMU. This policy must be strictly followed at all student events and activities. Use of obscene language (bad words, vulgar jokes etc.) and material that can spread hatred, or can be considered offensive to an ethnic, religious or cultural group is not allowed in KazNMU. 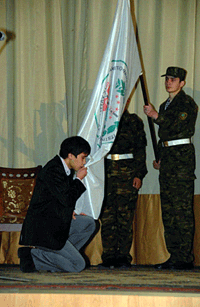 Student is a patriot of RK, honours state symbols-anthem, flag and state language as an attribute of Sovereign KZ. Student represents high human medical schools-anthem, flag and state language as an attribute of Sovereign KZ. Student has moral ethical priniciples common to all mankind. He/she keeps university traditions and does not admit interethnic disagreement, religious extremism, nationalism and corruption. Student makes his relations with teachers on the feelings of deep respect to elder persons, gratitude and thankfulness. Student recognizes necessity of international nationalization of student’s cooperation and necessity of three languages including a foreign language. Student recognizes necessity in making progress, observance of discipline and behavior at the university. Student considers health as necessity of healthy way of life and takes an active part against drinking alcohol, hooliganism and drug addiction. Student strictly keeps Honour Codex – the main ethical document of KazNMU named after S.D.Asfendiyarov. Formation of spiritual-moral, humanic personality; common human ethics principles and morality; development of self consciousness through ethic principles of moral University Codex. Formation of aesthetic culture. The aim: joining to the students’ life, social utility work, corporative culture, physical education, formation of psychological and moral health. II-nd Stage includes educational work among students of III-IV courses. III-rd Stage includes educational work of students of V-VI courses.